The Astronomer and I could barely stay awake when nightfall hit due to a combination of jet lag and over-stimulation. 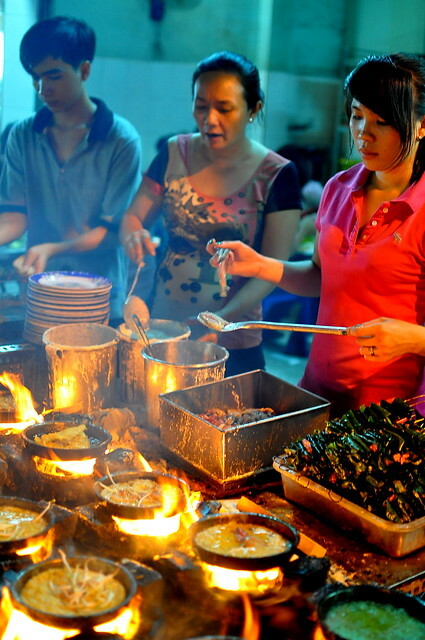 However, crawling into bed without a proper supper was completely out of the question, so we toughened up, called our friend Hanh, and made plans for flaming roadside banh xeo. This no-name restaurant in District 10 was the site of our final feast with friends three years ago, and we’ve been dreaming about it ever since. 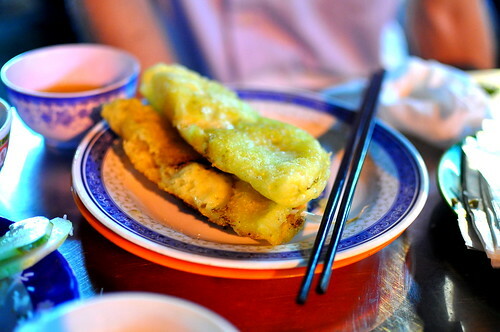 The specialty here is Central-stye banh xeo, small yellow pancakes stuffed with shell-on shrimp, fatty bits of pork, and beansprouts. 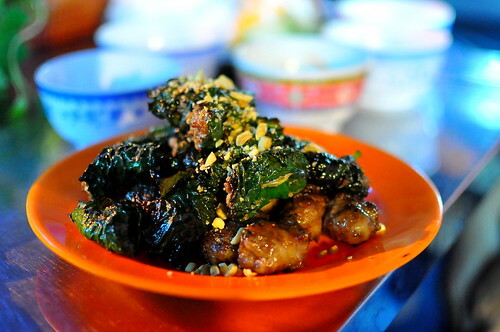 Whereas Southern-style bánh xèo are thin and lacy wok-sized beasts, their Central counterparts are smaller, crunchier, and heftier. 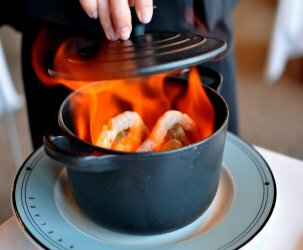 The bánh xèo are made in heavy-duty cast iron molds over open flames. A roadside kitchen means that the smoke and smells carry over onto the streets, beckoning passers by on motorbikes to come hither. I find the pomp and circumstance simply irresistible. 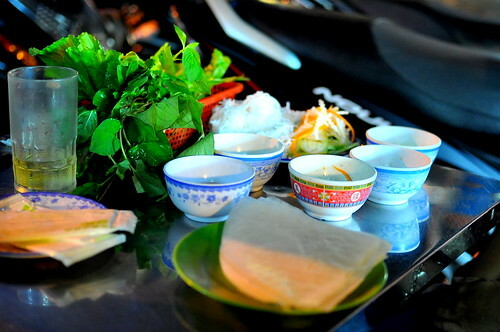 Before any food arrived, our table was set with a stack of rice papers, a basket of fresh herbs, and a plate containing noodles, pickled vegetables, and slices of star fruit and under-ripe bananas. There were also little bowls filled with fish sauce (nuoc cham) and fermented anchovy sauce (mam nem). The first dish was a platter of bo la lot (seasoned ground beef wrapped in betel leaves) and mo chai (ground beef rolled in caul fat). 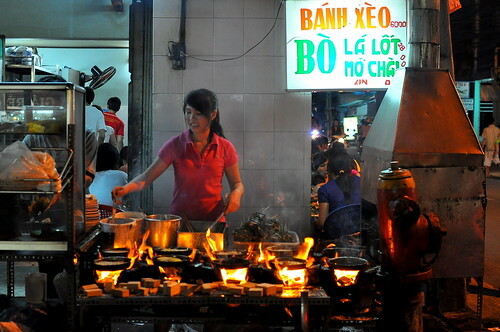 Both morsels were grilled on a stick over the same open flames as the banh xeo. 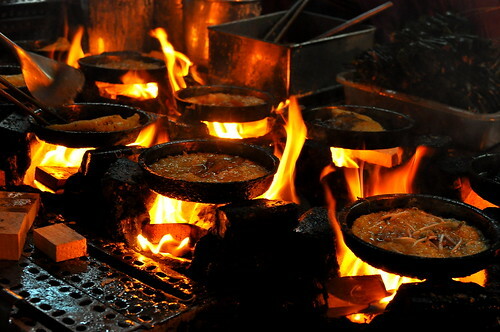 They were served scorching hot and topped with crushed peanuts. While The Astronomer and Hanh carefully wrapped their pieces of meat in rice papers and garnished with herbs and pickled vegetables, I took the lazy man’s route and dunked ’em in fish sauce and popped them in my mouth. The banh xeo came to the table soon after. Unfortunately, they were slightly underdone and bogged down by oil. 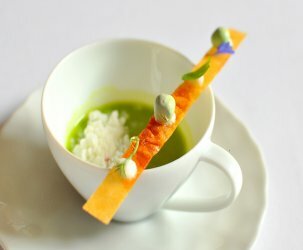 It was an extremely busy night at the restaurant and as a result, the kitchen had difficulty keeping up with demand. We certainly could’ve asked for better specimens, but I find it’s best to let things slide while in Saigon. 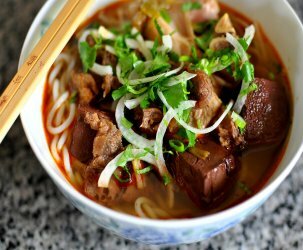 Không sao is a way of life here. I like the lazy-man’s route too. Plopping food in my mouf with both paws while yawning/burping. Looks like fun! look at those little things! adorable. but I do like ’em big, thin and lacy. and crispy. too much oil — no, cam on. Too much oil but also lots lots of vegetable, not only Banh Xeo but Vietnamese food generally balance the cholesterone with a dish of vegetable as big as the Antarctica. Anw, great shoot in such low light condition.